Use the instantaneous readings to grab a reading from each of the sensors while the Digit is connected via USB. The conversion equations used to convert each of these from a raw representation are described below. Alternatively, download the C++, or LabVIEW example code attached at the bottom of this page. Temperature on the Digit is stored as an unsigned 12 bit value, this value needs to be converted into a signed number, and multiplied by a conversion factor before it will look like degrees C. The raw value is a 16-bit number, the 4 lowermost bits being system flags. r's are reserved for flags. x's are the temperature information. X is the most significant temperature bit, discussed in step 2. Remove/Process the lowermost 4 bits (if non-zero). See flag descriptions below. Decide if positive or negative by looking at the most significant bit. If the MSB is 0, temperature is positive. Subtract 1 from the value. Invert every bit of the value (change 0s to 1s, and 1s to 0s). Perform a logical right hand shift of the value by 4 bits. Multiply the value by -1, to get the sign right. If the battery is dead, the TMP112 has failed, or a communication line between the temperature sensor and the microprocessor is damaged. the Digit will return a value of 32768. A value of 32768 converts into -128C, but normal operation will never return -128C, so it's a unique indication of an invalid reading. Raw light readings are saved as a number of timer counts in memory, ranging from 18-65535. In software the calibrated light value is generated through interpolation along a 3D surface (with some simplification). The temperature (to nearest 1°C) at the time of the light reading is used as an index, then the Digit's raw light value (timer counts) points to a region in-between Lux values, so interpolation is performed between the nearest 2 points in Lux. Due to the simplification of 1°C resolution, the interpolation is merely done on a 2D surface, the whole 3D surface does not need to be analyzed in software. If converting raw light readings sounds overwhelming, don't worry too much-just look at the C++ example code attached on this page. The 3D calibration surface is simply a header file[LightCalibration.h] with 3 static arrays. The light conversion code uses temperature as the first lookup index in the header file, which reduces the three large(1792 datapoint) arrays down into two 14 datapoint arrays that represent possible values of calibrated lux and raw light counts at the given temperature. Next, the raw light reading (DGT_LIGHT_RAW) is compared to each of the raw readings in the 14 datapoint array that contains raw values. Simple linear interpolation between the two nearest raw values will yield a fractional index of where the raw reading resides relative to the available calibration points. Finally, this fractional index is applied to interpolate between the nearest Lux values which yields the light reading in Lux. If the Digit is plugged/un-plugged from USB during a light reading in-progress, the reading is interrupted, and a 1 is saved instead of the timer value. A value of 1 converts to roughly 12000 Lux, but normal operation will never return a value of 1, so it's a unique indication of an invalid reading. Humidity readings are performed by an HCH-1000, which is a capacitive humidity sensor. A constant current source and a 10-bit ADC on the Digit-TLH work together to read the capacitance value, which is the raw humidity reading. DGT_HUMIDITY_RAW Craw. Get a new humidity reading from HCH-1000. Units are in 100s fF of capacitance. Craw. Get a new humidity reading from HCH-1000. Units are in 100s fF of capacitance. DGT_HUMIDITY_CAL_SLOPE The slope of humidity used in the conversion of raw humidity. Units in %Rh per 100s fF. The slope of humidity used in the conversion of raw humidity. Units in %Rh per 100s fF. Read the current temperature DGT_TEMPERATURE_LATEST_RAW*. Read the values of the CAL registers listed above. Use the "Master Equation" to calculate the %RH humidity. *In the case of downloaded data, use whatever temperature reading happened at the same time as the humidity reading (adjacent in memory). If the Digit does not have a humidity sensor, or the humidity sensor is broken, the raw humidity reading will be a value of 1. Normal operation will never return a value of 1, so it's a unique indication of an invalid reading. There is also a command (DGT_HUMIDITY_CAL_I_SOURCE) to initiate calibration of the constant current source, which is used during factory calibration, but it is not recommended to write to this register, unless you plan to re-calibrate the other parameters. DGT_TEMPERATURE_LATEST_RAW Get the latest temperature conversion, and begin a new conversion. Starting with FW1.21, temperature conversion is instantaneous. Units are described in TMP112 datasheet. Get the latest temperature conversion, and begin a new conversion. Starting with FW1.21, temperature conversion is instantaneous. Units are described in TMP112 datasheet. DGT_LIGHT_RAW Counts. Get a new light reading from LED. Units are in counts before reverse leakage complete. Counts. Get a new light reading from LED. Units are in counts before reverse leakage complete. Use the _DATASET, and START_TIME parameters to interpret downloaded data. Logged data must always be saved in one of the following sequences: T, TL, TH, THL, so downloading code simply reads the logged items, and interprets data space in segments of unsigned 16s. There are no timestamps saved with the data. Instead, use the DGT_LOG_START_TIME and the DGT_LOG_INTERVAL_INDEX_DATASET to determine when data was collected. DGT_LOG_ITEMS_DATASET Read what is logged in the dataset. Value is a bitmask. Bit0: 1 = Temperature logged, Bit1: 1 = Light logged, Bit2: 1 = Humidity logged. In memory: T, TL, TH, THL. Read what is logged in the dataset. Value is a bitmask. Bit0: 1 = Temperature logged, Bit1: 1 = Light logged, Bit2: 1 = Humidity logged. In memory: T, TL, TH, THL. DGT_STORED_BYTES Number of bytes of data stored on flash. Number of bytes of data stored on flash. DGT_FLASH_READ Read data from this address and subsequent addresses after pointer is initialized. Used to download data from the Digit. Read data from this address and subsequent addresses after pointer is initialized. Used to download data from the Digit. Change the configuration of the Digit with the following registers. Changes are applied when data is erased with DGT_FLASH_bkERASE. It is recommended that the Digit RTC is synchronized with the host computer with DGT_RTCC_TIME immediately prior to applying changes to configuration (calling DGT_FLASH_bkERASE). DGT_CHANGE_LOG_ITEMS Set the items to log. Value is a bitmask. 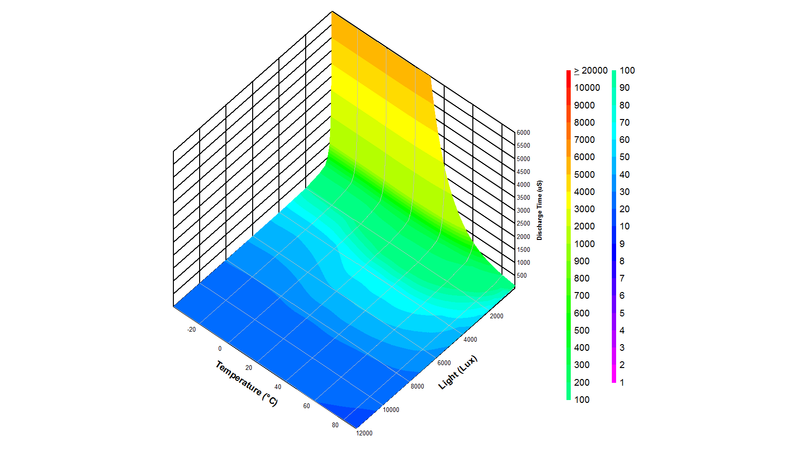 Bit0: 1 = Log Temperature, Bit1: 1 = Log Light, Bit2: 1 = Log Humidity. All other bits reserved. Change implemented on next erase of dataset. Set the items to log. Value is a bitmask. Bit0: 1 = Log Temperature, Bit1: 1 = Log Light, Bit2: 1 = Log Humidity. All other bits reserved. Change implemented on next erase of dataset. DGT_CHANGE_LOG_INTERVAL_INDEX Set the time interval between log events. Index 0=10s, 1=30s, 2=1m, 3=10m, 4=30m, 5=1h, 6=6h Change implemented on next erase of dataset. Set the time interval between log events. Index 0=10s, 1=30s, 2=1m, 3=10m, 4=30m, 5=1h, 6=6h Change implemented on next erase of dataset. DGT_FLASH_bkERASE Erase all data on the flash. KEY=Erase, Other=No effect, KEY=37157 Takes 5 seconds to complete, so poll the WIP status flag until =0. After erase, logging will begin immediately. Erase all data on the flash. KEY=Erase, Other=No effect, KEY=37157 Takes 5 seconds to complete, so poll the WIP status flag until =0. After erase, logging will begin immediately. Alarm thresholds, changing factory settings, and upgrading firmware are not covered in this doc. If you need information about these topics please contact [email protected] for more details.